Cards by Rita: Winner Winner Chicken Dinner! Congrats!!!! I love your card!!! Can't wait to hear which stamp set you chose. Enjoy!!!! Congrats, Rita! It is lovely! Lovely card! you deserve the win! Congrats!! Congrats Rita! It's an awesome card...total winner material in my book! It's so exciting to win a Shelli challenge isn't it! Have fun picking out your free set! TFS! congrats Rita! that is a great card! Not a surprise to me....I KNEW it was a winner! Have fun picking out that set....get the most expensive one you can, LOL! Congratulations! That is so exciting :) Enjoy picking out your new stamps! That is terrific! It's no surprise she chose this card, it's beautiful! You deserved to win with this great card. You are amazing! The card is a beauty! Congratulations Rita! Your card is beautiful so I'm not at all surprised that Shelli picked it! So happy for you...now, the hard part....choosing! Have fun! Congratulations! This card is absolutely stunning! 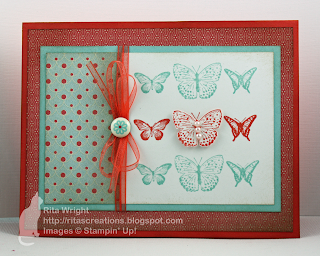 I love how you stamped the butterflies in the different colors and popped up the middle one! The entire design is just beautiful!